I is for ... Interruptions! So... i was going to be for Inspiration, but looking at the time that's elapsed since the last time entry in the A to Z of Writing, I think I'd better explain myself. Which means, I is for ... Interruptions! It may be a bit of a leap of faith to think I might have any readers left after leaving this blog gathering dust for nine months, but if there is anyone out there wondering what happened, wonder no longer. It's fair to say he's cheered up a bit! I was completely unprepared for just how much time a baby can absorb. 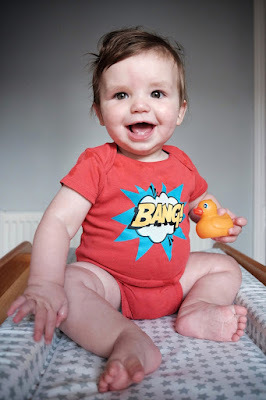 Before he arrived, I harboured what I now know to be wholly unrealistic visions of myself merrily tapping away at the keyboard while my son dozed in his cot beside me. Ha! I was so naive. Nothing is straightforward with a baby in the house. Everything takes three times as long, and requires five times as much energy. The simplest trip to the shops is doomed to failure without at least a solid hour's preparation. All those cliches about lack of sleep and perpetual exhaustion are true. There is, of course, an awful lot that compensates for this, but this is a writing blog, not a chirpy smug parenting one. Fatherhood, the day job, trying to get my photography venture off the ground, and writing all compete for the limited time available. For the last eight months, it hasn't been possible. Something had to give, and it was, sadly, the writing. I've kept my hand in, kind of. A few notes here and there, an idea or two floating around in my head. But no more than that. Initially I found it frustrating - I was beating myself up about not finding/making time to write. In the end I just had to accept that the stories, the novel, all of it, was going to have to wait. I hate the expression but I "gave myself permission" not to write. It's proved to be the most useful thing I could have done. Because, to drag this post back on topic, I've realised it's a fact of life that we all get interrupted. Things beyond our control have a habit of cropping up, and there's never a convenient time for that to happen. Whether it's the arrival of a miniature person who gets more amazing and wonderful with each passing day or just a phone call right when you're in the middle of a key scene, you can't let the interruptions get to you. Everything will settle down again, eventually, and even if what they settle down to isn't anything like you imagined, you will get back to what you were doing. As writers we need to learn to roll with the interruptions, not fight against them. Writing this post is a small victory for me, but an important one. It's been on my to-do list for at least a month. It's not going to win any awards. I don't even know if anybody will read it (do people still read blogs?). But it's confirmation that things are starting to settle down, little by little, and time and space might once again make themselves available for writing. I hope so. I feel like I'm well and truly ready for it. Funny, isn’t it, the way things work out sometimes? There I was, planning a post on humour, and the challenges of getting anything amusing published, when I received an email telling me one of my more bizarre stories had been shortlisted for Christopher Fielden’s Humorous Short Story Competition. I’m very pleased about that, as it means that even if it doesn’t go on to win a prize, Feeding the Creatives will be published in an anthology along with the winners and the other shortlisted stories. So while that’s undermined my point a little, I still think it’s worth lamenting how rare it is to find good examples of humour in mainstream short stories. Year after year, the judges' reports for places like the Bridport Prize plead for stories with a lighter touch. Reading an anthology from a 'serious' competition can be a dispiriting slog, as all too often a story about death will follow a story about a relationship breaking down, which in turn followed a story about a parent suffering senility (and, probably, then dying). My take on this is that there's a general feeling that when it comes to short stories, bleak is best. Trying too hard to be funny can mean the characters become cartoonish, or the plot is simply a mechanism for delivering the punchline. Besides, thinking about competition entries, it's much easier to make a story "powerful" if it's designed to make people feel sad. Mainly because things that make people sad are more universal than those that make them feel happy. Create a character people can relate to and have bad things happen to them. Take away someone they care about, threaten their safety, or deprive them of something they've worked hard for. Boom! Instant sadness, literary success, awards, etc. But misery is only part of life - and, one would hope, as small a part as possible. Stories that focus entirely on the dark side fail to capture the truth about life, with all its funny quirks, contradictions, and absurdities. Who could argue against the idea that making somebody laugh is better (and, potentially, harder) than making them feel sad? So why is there this persistent sense in writing competitions that for a story to be "good" it must be deadly serious? Some writers master this balancing of humour and proper grown-up emotion, and their stories are all the better for it. For instance, A L Kennedy, whose writing often leans heavily upon darker themes, tends to sprinkle amusing one-liners through her work and these - like seasoning in a meal - add a piquancy that lifts stories that otherwise could feel oppressively bleak. I've written before (ages ago!) about Rich Hall's story "Circadia", taken from his collection Magnificent Bastards. Here the humour comes from the characters and the strange situation in which they find themselves. It manages to be both funny and poignant, and I think each of these amplifies the other - to the extent where it remains one of my all-time favourite stories. So those are just a couple of examples of stories that manage to be both "funny" and "good", but I'm always on the hunt for more. Can anyone suggest any others? Incidentally, humorous novels don't seem quite so hard to track down, which makes me wonder if the rules are slightly different for longer stories. 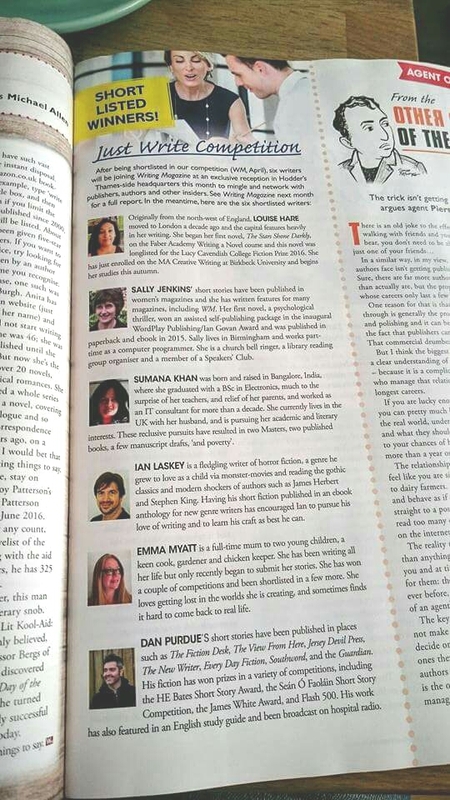 Those of you who follow me on Facebook or Twitter will know that I was lucky enough to be shortlisted in a competition held by Writing Magazine and Just Write. 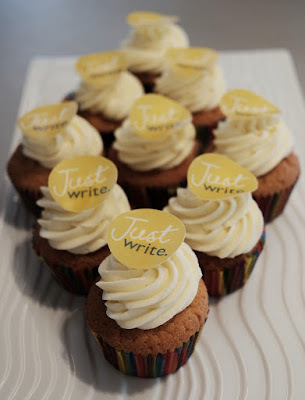 I'm assuming you already know about Writing Magazine, but you might not have heard of Just Write before. They're a team of editors and publishers working within the John Murray imprint that's part of Hodder & Stoughton, and they're responsible for the 20 or so creative writing books published in the "Teach Yourself" series. I saw the competition via a full-page ad in Writing Magazine. It caught my attention straightaway because although the overall winner's prize was pretty impressive (feedback on your work from the editorial team at Hodder), the reward for reaching the shortlist was almost as valuable - the chance to meet editors, publishers, and published authors at the reception evening where the winner would be announced. I sent a off a story and, not really expecting to get anywhere, more or less forgot about it immediately afterwards. I did, in fact, manage to forget about it so comprehensively that when I received an email from Jonathan Telfer, editor of Writing Magazine, telling me I'd reached the shortlist, I genuinely had no idea which story I'd sent until I checked my competition tracker spreadsheet. So it was definitely a nice surprise! The next bit was the tricky part - keeping quiet about it for a couple of weeks until the shortlist was announced in the next issue of the magazine. But soon enough the magazine hit the newsstands and I could let people know, and also get my first look at my fellow shortlistees. 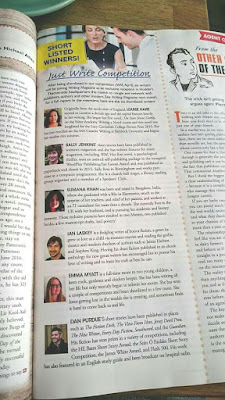 I recognised Sally Jenkins from her blog and from the Talkback website, but the other four were new names to me. So that was a few weeks ago. Fast-forward to Thursday afternoon, and I was travelling down to London to find out what this reception party was all about - and, of course, discover which one of us had won. The Hodder building is slap bang in the middle of the city, on the north bank of the Thames. I arrived uncharacteristically early, and on my way to the Hodder building I bumped into Emma Myatt, another shortlisted writer. 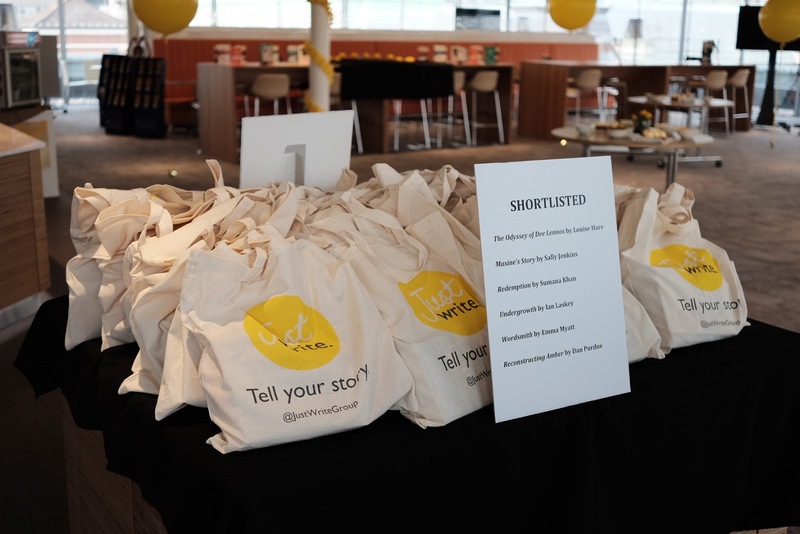 Soon we were joined by the other four and whisked up to the Hodder and Stoughton offices, presented with some very fine goody bags, and subjected to a mercifully brief interview about our writing. This was on camera, and I discovered I really need to work on my technique - unsure whether to look directly at the camera, at the interviewer, or just, y'know, elsewhere, I opted for a mix of all three and will probably look like I'm watching a moth flying around the room. Ah, well. 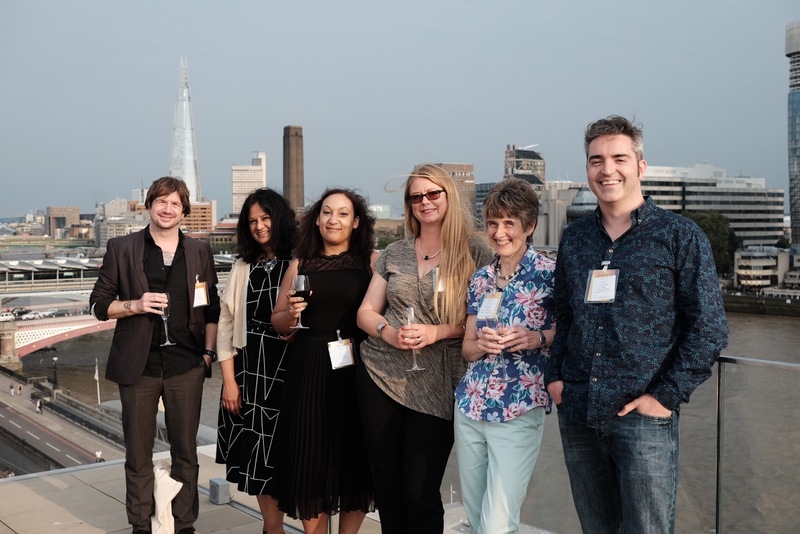 Once our interrogations interviews were out of the way, we headed up to the stunning rooftop café and garden terrace for some fizz and photos while we chatted to editors, publishers, people from Cornerstones Literary Consultancy, and several published authors. For me, this was the part that seemed the most surreal - standing there sipping sparkling wine on a sunny London rooftop, talking to people with actual proper jobs in the publishing industry who'd read our work and had very encouraging things to say about it. I'm sure I speak for all six of us when I say this was an unforgettable experience and one that'll keep our levels of inspiration topped up for a long time to come. After a couple of brief speeches by two Jonathans - chief editors at Just Write and Writing Magazine respectively - it was time for the moment of truth. The envelope was opened and the name of the winner was read out. And it was... Emma Myatt! I know it's the done thing to say that one doesn't mind losing out to somebody else in these circumstances, but in this instance it's genuinely true. After spending the afternoon with the other five shortlisters, I'd have been truly happy to see any one of them bag that prize. As something of a consolation, the organisers had arranged for all six stories to be printed in a limited-edition book. Emma was given a genuinely unique hardback edition, and the rest of us collected a few paperback versions each. It was a added thrill in an already amazing day, as naturally the six of us had discussed our stories and we were all itching to find out what everybody else had written. I'm really looking forward to reading them all. 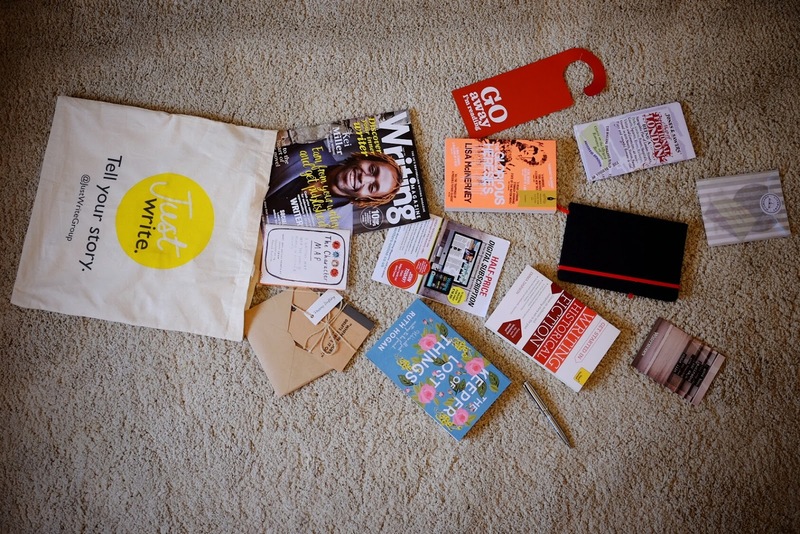 If you're a writer reading this and wishing you'd entered the competition, or you did enter but didn't reach the final six, the good news is that Writing Magazine will be running it again in the future. 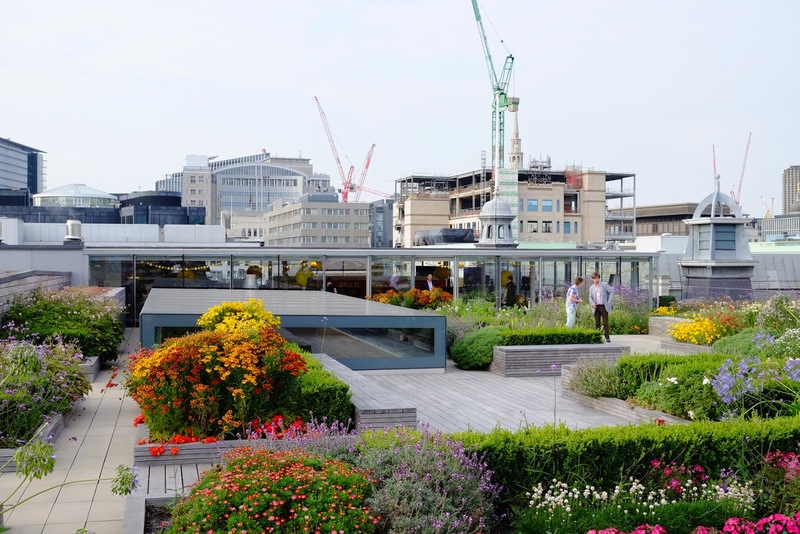 Keep an eye on the magazine for details and, who knows, next time it could be you sipping champagne on that rooftop terrace! G was going to be for Grammar. But I've said quite a lot about that here (and here), and I'm trying not to go over too much old ground. So, G can be for Genre. "Oh, really? What kind of thing do you write?" There you have it. It's the worst thing anybody can ask you in some ways, but in others it makes perfect sense. Is yours the kind of writing I'm likely to be interested in or not? It's a way of establishing where your books might sit in the bookshop. To some extent, it's a way of establishing who your readers are, although I'm never entirely sure that's a good idea. I don't know how many people jump around the genres as much as I do when it comes to choosing something to read. I'll pretty much pick up anything, if it seems like it'll be worth my time and effort. So far I can't claim to have ventured into the murky world of, say, dinosaur erotica, but if I met someone who could recommend a title and make it sound compelling I'd probably give it a go. I'd like to think most people don't think of books as being divided into two camps - The Stuff I Know I Like and The Other Stuff - but sometimes I'm not so sure. You do find people who only ever read crime, or break out in hives if they leave the science fiction section of the bookshop. It can't be good to restrict your intake to that extent, but I suppose it limits your chances of being stuck with something you really don't get on with. A bit, at least. Surely it makes life pretty dull, though? 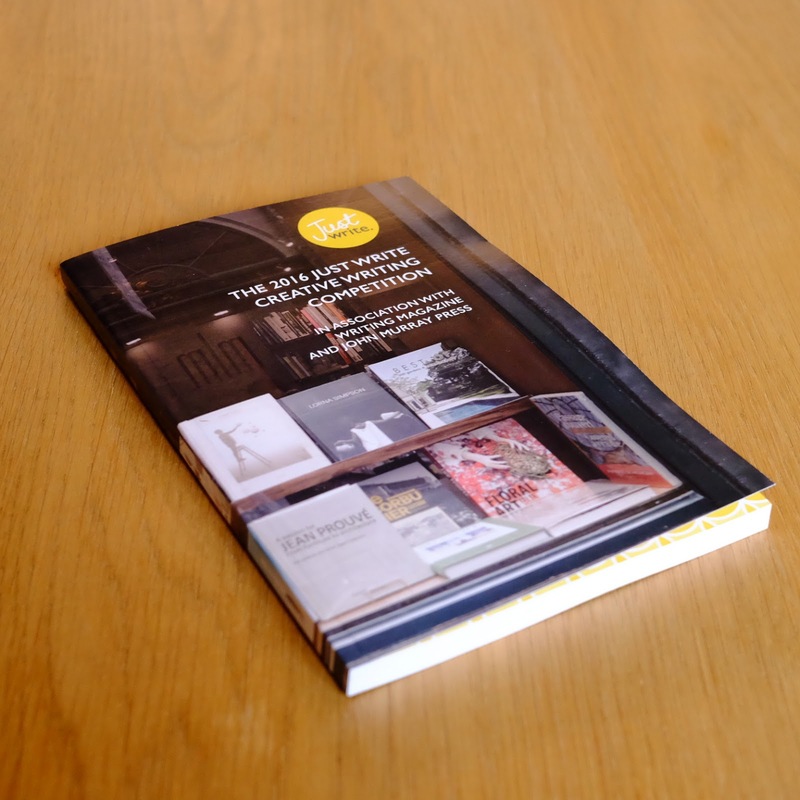 Some journals and magazine use genre as a sort of filter. The idea that modern "literary" fiction is a genre in itself doesn't seem to occur to the editors of these kinds of places. "No genre fiction", they'll cry in their submissions guidelines, with the sniffy assumption that a story with a robot or a monster as a character is automatically excluded from actually being any good. Sure, there's plenty of dross written in the sci-fi and horror realms, but it's no more prevalent there than anywhere else. I mean, some of the stuff that gets published purely because of its "literary" badge should really go and take a good long look at itself in the mirror, for a start. Personally, I think that while the use of genre has its uses for readers, most writers would be better off ignoring it. Sitting down to write a story in a particular genre immediately saddles you with all sorts of baggage, conventions, clichés, and expectations that will start to shape your story before you've even written the first sentence. Put those aside and concentrate on the character or idea that fascinates you, and don't worry about what pigeonhole it ends up slotting into until after it's written. Because, really, who cares whether it turns out to be a western, a space opera, a historical yarn, or the tale of the forbidden (and anachronistic) love between a caveman and a rebellious young stegosaurus from the wrong side of the tracks? If it's a good story, it's a good story.